Leadership capacity is more than simply skill development; it’s about performance, growth, transformation and change. “Leadership Capacity is the skilful use of leadership attributes for the growth and development of ourselves, our colleagues and our organization”. Great leaders not only understand how to engage and inspire their teams to get the best results — they understand the need to create participatory and collaborative processes that develop the abilities of the next generation of leaders. Successful companies do not happen by accident. They are the result of building effective leadership capacity and an awareness and willingness to take the necessary steps in identify internal talent and nurture them into the leaders of tomorrow. Builds an internal development system: Not unlike a great sports dynasty with a deep pool of talent in their farm teams, strong leaders foster leadership in all levels of their organization. When leadership capacity is developed at all levels of the organization, it creates a farm system of future leaders that will be prepared to move up and take on new challenges, preventing the organization from experiencing a future leadership gap. Internal leadership capabilities also create a rich internal resource of new and innovative ideas that management can consult when charting out the future of the organization. Creates a competitive advantage: Companies that invest in leadership development are the minority. Organizations and their leadership get caught up and focus on the day to day operations of the business — the most pressing issues that drive short term results. They forget to invest time in the future because the ROI is less obvious. When this happens, it is the long term vision and growth potential that tends to suffer because of gaps in leadership transition. If your organization is one of the few that consistently commits to developing internal leadership capacity and is constantly producing future leaders, you will have an advantage over competitors — not only because ideas and innovative thinking are constantly being revitalized, but also the ability to attract the best new talent that can be developed into future leaders. Fosters innovation: Leaders at the top of the organization need to intentionally gather information from across the organization. To consistently have the ability to grow and stay fresh with your thinking you need leaders at all levels of your organization that are able to evaluate activities and provide honest feedback based on understanding the vision and values of the organization. 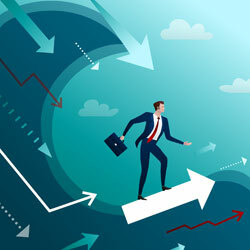 When employees are given additional responsibilities and the ability to make decisions, this puts them in a position to expand their capabilities, grow as an employee, and develop their skills — which leads to new insights, perspectives, and efficiencies that benefit the broader organization as well. Leadership has a direct impact on your company’s ability to grow. While much of the attention about leadership is focused on the leaders at the top of the organization, it is the leaders at the mid-level and front line that have the greatest direct impact on growth. No matter where your leadership development is as an organization, here are 4 critical elements to consider when evaluating the overall leadership capacity and culture within your organization. Establish and communicate a clear direction: Strong leaders communicate a vision that inspires and attracts people with shared beliefs and values. Having a clear direction ensures that the correct infrastructure, resources and people are in place to advance the growth process. A clear direction also provides leaders with a measuring stick they can use to gauge decisions, strategy and future planning. A clear direction, clearly communicated is also a highly effective recruitment tool for other top performers. Define goals and objectives: Leaders that clearly lay out the specific goals and objectives not only for the organization, but for each department, project, and employee make it easier for employees to commit to those outcomes. Everyone needs to be clear on what success looks like in the organization. Leaders that define what needs to be done will have greater success gaining the desired results from their people. Set standards of behaviour: Outcomes are important — but by themselves can be detrimental to the organization if the “how” is also not clarified. Great leaders understand that leadership starts first through the behaviours they model; however, true leadership capacity is more than simply leading by example. Leaders must create a working environment that fosters and rewards desired behaviour in addition to the desired outcomes. Embed continuous improvement into your culture: Many organizations are pretty good at the first 3 elements — but fall down in the area of continuous improvement, which is the most critical. This only occurs when everyone in the organization is committed to building their own leadership capacity and helping the organization grow and evolve based on people willing to providing input from across the organization. If the organization only has direction, goals and behaviours — without the consistent, positive tension of personal contribution and improvement, senior leaders lose the benefit of the wealth of ideas from less senior leaders across the organization. Resultant, the farm system is not strengthened and the flow of innovative thinking is stifled. What can leaders do tomorrow? Building out your leadership capacity must one of your prime objectives. Without building your personal leadership capacity, you will inhibit both your personal and companies’ ability to change and grow. Leadership impacts performance and performance impacts growth. Growth will not happen if people do not perform. Effective leadership builds more effective people, teams, and organizations. When leadership is present at all levels it helps to accelerate business results and makes it possible to fire up change and growth. Consider this information and think about how it applies to you as a leader and your company. Think about the current state of your leadership and think about ways that you can put yourself in a position to be a better leader and achieve change in your organization — even from the bottom up. Bill Hogg is widely recognized as the Performance Excelerator™. This is due to his ability to create profound change and deliver extraordinary results within the most demanding organizations. He works with senior leadership teams to navigate change and transform organizations into high performance, customer-focused cultures that create long-term, profitable relationships with your customers and excelerate performance and productivity with leaders and employees.